244 pages | 2 B/W Illus. Offering a fresh perspective on the changing face of terror attacks, Terrorism in America focuses on domestic groups, examining the beliefs, actions, and impacts of American-based terrorists and terror organizations. Editors Robin Valeri and Kevin Borgeson and their contributors draw on theories from criminology, psychology, and sociology to explore the ideologies of right-wing, left-wing, and extremist religious groups—how and why they convert followers, recruit financially, and take extreme action against others. No competing text offers such in-depth and nuanced coverage of the radical ideologies behind these attacks, or the ensuing fear domestic terrorism creates, as well as the strategies to combat violent extremism. A core text for domestic terrorism courses and an excellent supplement for any counterterrorism or homeland security course, Terrorism in America brings its singular focus to the growth and evolution of terrorism in the United States. Interviews, case studies from the field, and chapter themes make this a highly readable text for criminal justice, psychology, sociology, and homeland security students, professors, or practitioners. 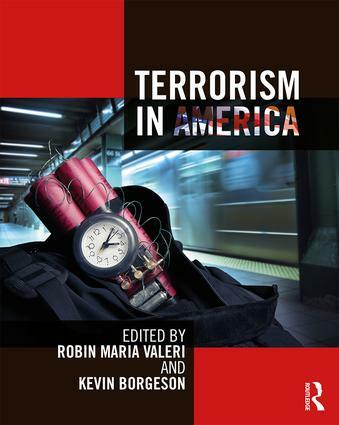 "[Terrorism in America’s] coverage of this subject from a criminological perspective is so insightful and detailed that it will also appeal to a broader audience that seeks to understand the magnitude of domestic terrorist threats facing America." – Book Review in Perspectives on Terrorism, Vol. 13, Issue 1 (Feb. 2019), pp. 13-14. Robin Maria Valeri, PhD, Professor of Psychology, St. Bonaventure University and Volunteer Fire Fighter, earned her BA from Cornell University and her MA and PhD from Syracuse University. Kevin Borgeson, PhD, Associate Professor of Criminal Justice and Research Fellow for the Center for Holocaust and Genocide Studies, Salem State University, earned his BA from Bridgewater State College and his PhD from Northeastern University. Together they have co-edited Terrorism in America and Hate Crimes: Victims, Motivations and Typologies and are the co-authors of Skinhead History, Identity and Culture as well as several chapters and articles, including "Sticks and Stones: When the Words of Hatred Become Weapons" in Global Perspectives on Youth Gang Behavior, Violence, and Weapons and "Masculine Identities within the Skinhead Movement" in Advances in Sociology Research.